The new Russian cabinet will not be announced for several days, but that has not stopped analysts from speculating as to its composition. On May 15, Prime Minister Dmitry Medvedev presented to President Vladimir Putin the structure and composition of the new cabinet. A Kremlin source believes that early appointments to the new government could take place as early as May 19, and the rest after May 20. “We will not make the composition public so as not to stir up excessive interest,” Medvedev said upon presenting the list to Putin, according to kremlin.ru. Medvedev has formed a government of hopefuls, said one Kremlin official, saying the cabinet included many new, young people. The president gave the prime minister a free hand in forming the government and promised not to insist on his own candidates, said a source close to the President’s administration. The source said that Putin left his own people in only three positions: Anton Siluanov at the Finance Ministry, Andrei Belousov at the Ministry for Economic Development and Igor Artemyev at the Federal Anti-Monopoly Service. Two government officials confirmed that the president and prime minister agreed upon these candidacies in advance. The three Putin candidates are to provide a counterweight to Medvedev’s team, whose key members at present are Arkady Dvorkovich, Mikhail Abyzov and Alexander Voloshin. Sources speculate that Dvorkovich and Abyzov are likely to be promoted to deputy prime minister, with Dvorkovich taking over a portfolio containing industry, agriculture and transportation and Abyzov managing the open government project. Another source, however, said that Abyzov will take over open government, but will not be deputy prime minister. Other buzz has Abyzov heading up the Energy Ministry, although other sources place Vladimir Rashevsky, the 38-year-old director of the Siberian Coal Energy Company (SUEK), in that position. Yet all sources agree that the current deputy prime minister in charge of the fuel and energy complex, Igor Sechin, will not keep his job and will most probably leave the government. There is a similar consensus concerning Interior Minister Rashid Nurgaliyev. Current Minister for Economic Development Elvira Nabiullina will leave the cabinet. Some sources say that she turned down an offer to be a deputy prime minister responsible for social programs. A Kremlin official insists, however, that Nabiullina will be a member of the Medvedev government, while Andrei Belousov, currently head of the economic and finance department of the government, will not succeed Nabuillina, but will rather become the president’s economic advisor – the position currently held by Arkady Dvorkovich. Igor Shuvalov, who is equally close to Medvedev and Putin, will remain the senior deputy prime minister. He will remain in charge of the financial agencies he inherited from former Finance Minister Alexei Kudrin. 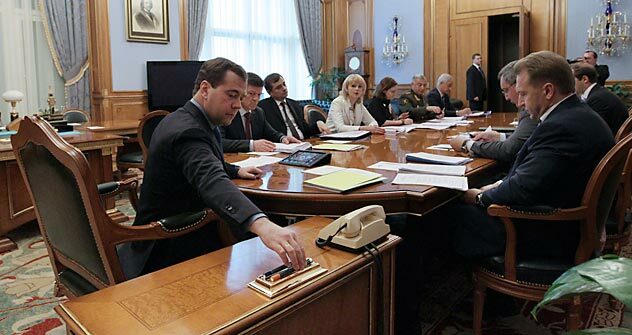 According to Kremlin rumors, Medvedev was planning to appoint Vyacheslav Surkov as his chief of staff, but now speculation has Surkov continuing to be in charge of science, innovations and culture. “The new team must be able to pursue the common cause and move towards the same goal,” said Kudrin. The Putin cabinet accomplished less than it could have because its members worked at cross-purposes, he said. “Sechin and I have different ideas about economic regulation and a cross between our two positions is not an optimal system,” he explained. Putin has borrowed Boris Yeltsin’s approach of not giving a free hand to any one team, another Kremlin source agrees. The president believes that this is not the time for rushing reforms, but for proceeding carefully.